Lately I have been working on several websites, one of them being an e-commerce site that is due to launch Aug. 1st. As the deadline draws nearer and nearer I have found myself anxious to see what will become of this site. Will it blow up and be the next hottest thing since ebay or will it fail miserably after 2 months or rather, will it live in the middle ground with consistent sales and traffic. It’s quite the social experiment and I’ve been racking my brain with hypothesizes. As any good scientist would do, I am conducting research. There is a ton of great information over at Shopper Culture and here are a few excerpts. According to an Integer® and M/A/R/C® monthly shopper update, “The Checkout”, in February, deal-seeking was consistently ranked as the primary motivator for shopping. In addition, when looking at people’s primary shopping goals, spending as little money as possible (28%) comes in way ahead of spending as little time as possible in store (6%). It seems as if online markets aren’t nearly as affected as traditional retail in the present economic downturn. 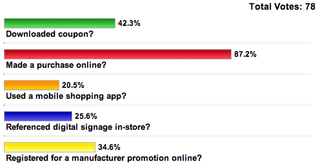 Things are looking good for e-commerce in late 2009. Overall the trends are running right and combined with a solid eco-friendly product I am predicting good things. I can’t wait to report back after the site is up and running for a few months. Stay tuned for the site launch!